The state of California requires each school district to create a Local Control Accountability Plan (LCAP) annually. This is a document that is created with input from all stakeholders as a plan for educating and supporting all students. We are in our sixth year of revising the LCAP and are now working on the document for the 2019-20 school year. As always, we need and value input from all our stakeholders as we make plans on how to best support our students and prepare them for their futures. 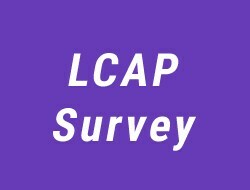 Your input will be calibrated with other input and student data to determine what will be included in the LCAP. Your answers will remain anonymous.